8' 9" x 12' 9"
Peking - 8' 9" x 12' 9"
The best Peking carpets woven after the turn of the nineteenth century continued the reserved design and technical standards of the Ningshia carpets produced earlier in imperial Chinese court workshops. Here we see a classic Chinese design with an openwork central medallion of geometric and floral elements, surrounded by the ‘hundred and one gifts’ pattern in a largely open field. Fretwork and floral corner-pieces complete the field, enclosed by a narrow, understated running meander. 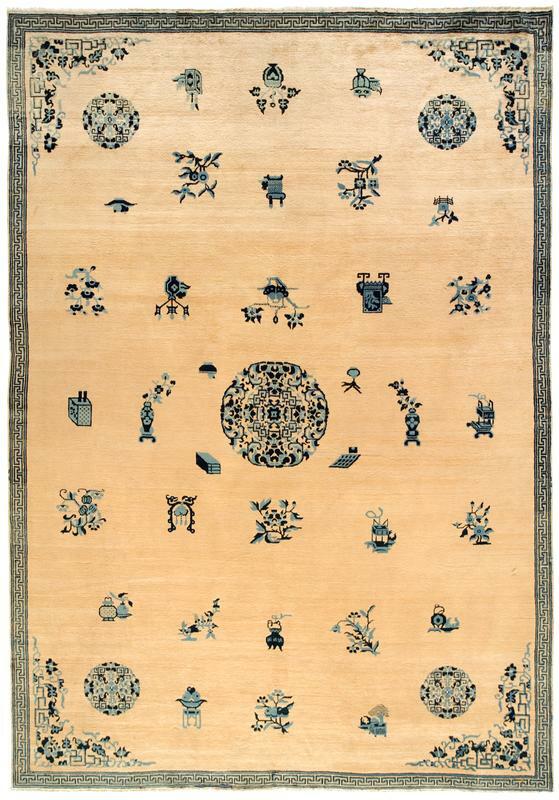 The restrained, soft palette of tan, soft blue, and ivory, with sparing dark blue accents, also continues the grand tradition of Chinese court carpets.